Have you tried our house-made Miso Soup? 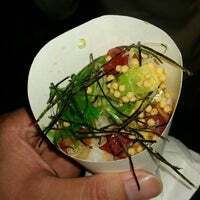 Love the poké, had some concerns about the blue fin they were serving, but one of the partners came out and we talked about their dedication to sustainable seafood and where they source their bluefin. 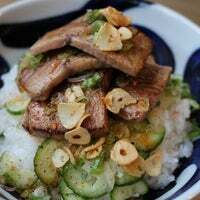 The Goma Shoyu Tuna poké bowl was delicious! 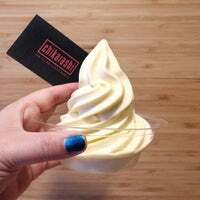 I will have to come back for the Dole Whip pineapple soft-serve. They also sell Schweppes Cream Soda here! 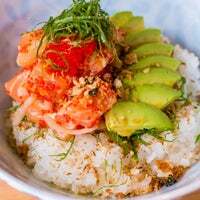 Pricey but delicious and very healthy poke bowls. The Sichuan chili salmon is the winner. Had the sichuan chili salmon and ponzu salmon. Best poke in the city! Better than pokeworks and wisefish poke because the dish is comes as is. The flavors are perfectly melded and balanced! I got the chili salmon bowl. There is almost no space for seating, but you can do a take-out and eat it at nearby parks. You can upgrade the bowl size to large to get more fish. Food is delicious. 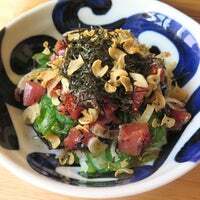 You can't go wrong with the goma shoyu tuna bowl. The regular size was perfect but next time I might go for the large to get more fish. The price may turn you away at first but once you eat anything here you just get it. Quality. Freshness. Taste. Prep. It’s simply delicious. Shoyu poke! If you want to try their wasabi mayo-- try and ask for more mayo because it's not as spicy as you think! The portions of poke vs. Rice is small. Eat all the poke! Traditional tuna is solid as is the salmon with mayo. Collect 'em all! Was very good. I got a regular size that left me hungry...and also got some supreme tuna which pushed my bowl to the $19 range. I won't do that again seeing as how I got 10 tiny cubes of fish. Really good place to have poke food! I ate a rice bowl with tuna and avocado, amazing! The fluke is excellent. Pair with a Dole whip. It's a bit pricey for the neighborhood but can't argue with the quality of fish. Haven't tried a poke bowl but their dole whip is really good and refreshing! 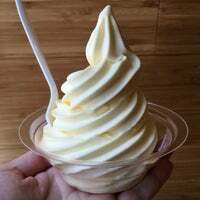 Come here for the Dole Whip, they can do a swirl with their special rotating flavor of the day. 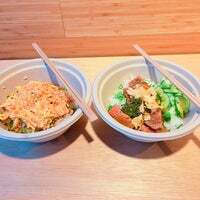 Poké bowls galore (traditional and with a twist)! And dole whip for days! You can ask for half rice and half greens for a lighter portion. 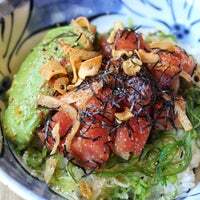 Great poke bowls and the fish they use are so fresh! A pity that the portions are too small. More chirashi than poké, it just has too much rice. 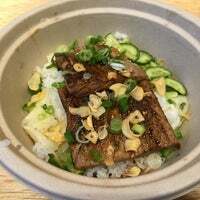 Still, the bowls are fresh and flavorful, a nice find. Blue fin toro on point! Bowls are awesome. Sichuan bowl is great but will try others too. Cool spot but not as good as Seamore's poke. Did like the dole soft serve. If you haven't been, get the chikarashi flight. Be warned, it's a lot of food. 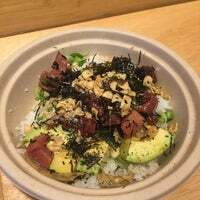 Great poke, but the tofu bowl is also excellent. They got a dope pineapple ice cream. The Goma Shoyu Tuna is amazing! 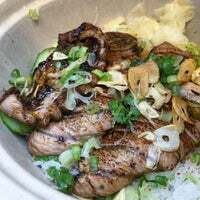 Unagi Bowl was mind blowing. Pretty good but expensive and they're stingy on the fish if order a large. Been There the Food is delicious.. They have Dole Whip. Enough said. Was not terribly impressed and am surprised by that. I think Ill have to try it again. 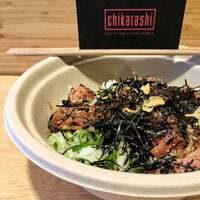 Chikarashi offers a contemporary perspective on Hawaiian poké, influenced by Japanese chirashi. 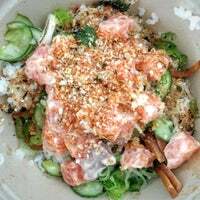 "Build your own bowl with rice, zucchini noodles, double salmon, edamame and seaweed salad. 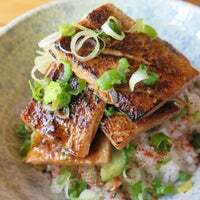 Citrus soy sauce is great! 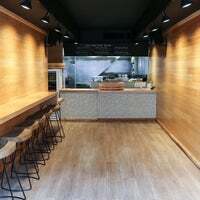 The staff is so gentle, they tell you everything you can choose from the menu..."
"Great back area with lots of tables! 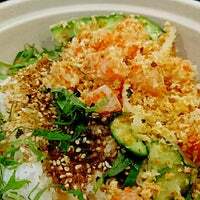 Appreciate that the poke bowls come with seaweed salad!" "Uma fila gigante no almoço, mas costuma ir rápido! Fui de poké burrito e preferi montar o meu, com menos molhos e misturas, parece um temaki turbinado! Uma boa é comer no Bryant Park ali pertinho :)"
"Coconut milk tea with bubbles is my favorite 👍🏻"